such as client location, server load and content distribution. It orchestrates your TV delivery and allows you to distribute your TV delivery closer to the viewer, optimizing their viewing experience. 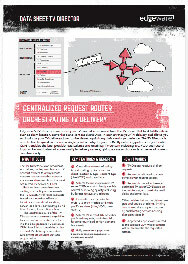 The TV Director is a centralized request router and a single point of entry for your CDN. By enforcing policies for your entire CDN it enables the best possible load balance and reliability. TV content including live, VOD and recordings can be load balanced across multiple delivery servers, giving access to thousands of pieces of content simultaneously.